Sideshow World, Freak, Geeks, History Central, Sideshow Performers from around the world. 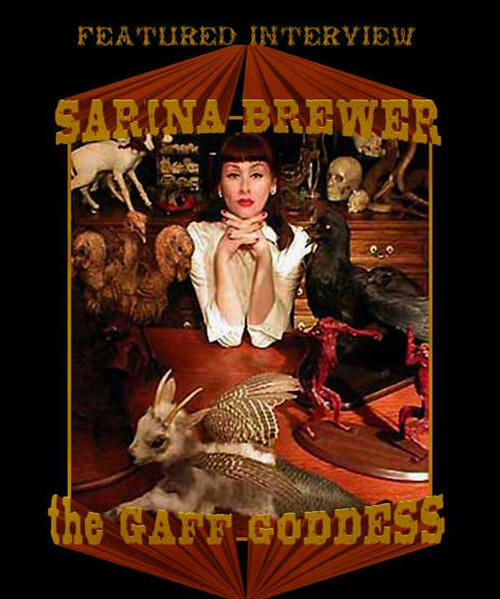 Our featured interview this month is with Sarina Brewer founder of Custom Creature Taxidermy Arts. She is an internationally known taxidermist and gaff artist…also a founding member of the Minnesota Association of Rogue Taxidermists. SSW: Sarnia, how did you become interested in gaffs? SB: Being the hopeless science nerd and sci-fi freak that I am, I've always been interested in anomalies of nature; frogs with extra legs, cows with 2 heads, cyclops piglets, etc. I loved going to the sideshow tents at the State Fair as a kid where I could see living animals with parasitic twins and other bizarre deformities. It obviously made quite an impression on me! I've been actively collecting natural history related items for close to 30 years. It was around the time I was in college that I began to seek out and collect genuine freak animal taxidermy mounts. But since they were relatively hard to come by and generally expensive, I couldn't afford most of what I wanted to buy on my starving artist shoestring budget. So I decided to try my hand at creating fake freak animals for my collection. My very first attempt at taxidermy resulted in a squirrel with 2 heads (I never could keep it between the lines) I sell most of what I make as soon as it's completed, but that squirrel still hangs proudly in my showroom, just like the first dollar taped to the wall behind the cash register at a pub. SSW: Who are some of the people who have influenced your gaff work? SB: There isn't really anyone who has influenced my gaff work. 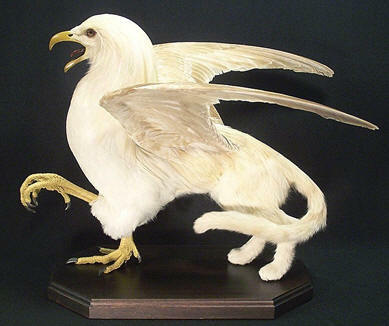 However, my taxidermy work in general has been influenced by pioneering "rogue taxidermists" of the world. Not that I do a lot of anthropomorphic taxidermy mounts, but I'm captivated by the work of Walter Potter and his dioramas of kittens at tea parties and little bunnies going to school. I'm also inspired by the numerous unsung heroes of the rogue taxidermy world - like whoever decided to slap some antlers on a rabbit, thus creating one of the best known creatures of folklore in the world. 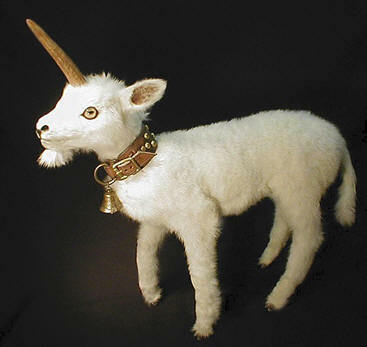 But really all antique taxidermy mounts inspire me. Before the age of pre-fab urethane foam deer heads a taxidermist also needed to be an anatomist. In order to make the animal look real and look alive you had to know every muscle, every bone, every structure inside and out in order to recreate it. Today's world of sportsman's mounts is very assembly line. Many taxidermist don't even tan their own skins anymore, they send the deer hide away to get it tanned. Then when they get it back they mount the skin to a pre-fab form. I'm not saying that doesn't take any skill, but in my mind the true test for a taxidermist is someone who can make a realistic mount the old fashioned way; Cleaning the flesh from the bones, re-assembling and wiring them back together, then rebuild the musculature using clay, maché, twine, and shredded jute. It totally blows my mind to think how much work went into the taxidermy mounts in the dioramas at the Field museum or Smithsonian in a day before prefab mannequins. Those are the taxidermists I aspire to be more like and that have driven me to hone my skills. SSW: What influenced your decision to become a taxidermist? SB: What I do was more of an evolution than a decision, and it’s been a very gradual evolution over the years. I've always considered myself an artist first and a taxidermist second – more precisely an artist whose medium is animal components, in the same way a sculptor's medium is clay or steel. When people ask me what I do for a living I simply answer "artist". If prodded for details - "taxidermy sculpture" is the term I settled on. My journey to taxidermy actually began when I was a painter attending art school. SSW: Could you tell us a little more about your schooling? SB: I graduated with a BFA from the Minneapolis College of Art in design in 1992. While in college I worked predominantly with oil paint and found objects, creating collagé style abstract paintings and shadow boxes. During these formative years the found objects I incorporated into my work consisted mainly of mummified animal remains and bones. It was around this time that I also began doing restoration on dilapidated vintage taxidermy mounts that I scored at junk stores. I noticed that the process of preparing animal remains for use in my art had a lot of similarities to what I was doing while restoring the old mounts. Up until that point I was learning only through trial and error. So I bought a few books to learn more conventional techniques of preserving animal remains. I ended up learning how to mount an animal from start to finish. I'm totally self-taught in this realm. Initially there was a lot of blood, sweat, and tears (mostly my blood) but my mantra has always been practice makes perfect. My study of anatomy over the years also proved crucial knowledge necessary for taxidermy work. Without it, it's impossible to create a life-like mount, be it a real animal or a fictional one. The whole taxidermy process just came to me so naturally. It was weird. Not sure how to verbalize it – not to sound like a total nut job, but it's almost like the animals tell me what they want to be. Like clay in the hands of a sculptor, it's like my creatures create themselves in a way. I just new this was my calling and what I had to do. SSW: I understand you have done some work for museums. Could you tell us about that experience? SSW: Tell us a little about the different types of work you do? I’m especially interested in what you call your fantasy mounts. SB: I make the best use out of all of the animal materials I get. My work takes several directions. I make things out of all of the scraps that a regular taxidermist would throw in the garbage; I make accessories like necklaces and keychains out of leftover bits like paws and tails and I pickle internal organs for study and display. But my favorite way to recycle is creating "carcass-art". 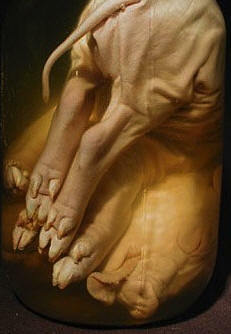 I mount and dry the skinned carcasses of small animals in anthropomorphic poses. Even though these are some of my favorites, they disturb people that have a fear of what lies under the skin. I'm fascinated with the inner workings of animals. I think animals are just as beautiful and intriguing on the inside as they were on the outside. 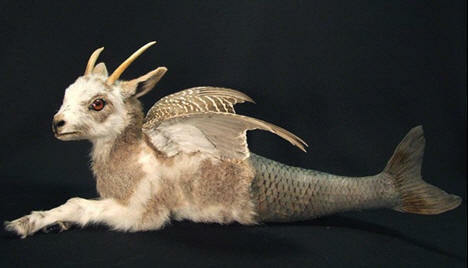 But my specialty is creating composite-animal taxidermy work. "Fantasy mounts" is simply an all-encompassing term I use for any fictional animals I create, be they cryptoids or freaks. SSW: How has your interest in Cryptozoology influenced your work? SB: Cryptozoology, folklore, and mythology are intertwined on many levels and are an endless source of ideas. I'm inspired by classical beasts of Roman and Greek mythology such as the centaurs and satyrs. But I'm just as inspired by creatures of folklore like the wolpertinger and hodag. Mythological beasts were often simply combinations of animals already known to ancient peoples. Like the griffin; half eagle half lion. Or the Chimera; a lion with a goat sprouting out of it’s back with a snake for a tail. I use plenty of artist license when creating my versions of these classics, but I often substitute with the closest proxy I can find. For example; I'll use a wild cat instead of a lion, or a crow instead of an eagle, etc. Creating these types of fantasy mounts presents more of a challenge than creating one of my barnyard freaks. Since mythological animals don't exist in real life, it can be tricky mounting one in a way that looks like it would have a natural movement and looks "alive" – hard to visualize when you've never seen a living one. The mannequins are also more of a challenge to create – obviously there aren't any pre-fab forms for Capricorns and Griffins. SSW: Who’s buying gaffs…showmen, collectors, or is it just someone who wants a conversation piece? SB: I've sort of carved out a unique niche for myself in the art world. There's quite a bit of variety in what I offer so it has a broad range of appeal. I sell to people from all walks of life, catering to everyone from sideshow exhibitors and tattoo shop proprietors, to collectors of fine art and other artists themselves. It's hard to say what percentage of my customers comprise showmen and what percentage comprise collectors, etc. It's everybody; a doctor buying a squirrel liquor decanter for one of his friends, a guy buying a squirrel head trophy as a gag-gift for a hunting buddy, a club-going urban vampire buying a boar heart dome as a Valentine's day gift for his significant other, a receptionist buying the magic mystery paw as a white elephant Christmas gift for her brother, or a woman buying a griffin as an anniversary present for her husband, etc., etc. It really runs the gamut. Definitely showmen comprise a good portion of sales, but there also seems to be a growing number of tattoo/piercing shop owners who are setting up formal parlors in their shops - waiting rooms decorated with outlandish curiosities to draw in more customers. SSW: How have you been accepted by the sideshow community? Have you had any unusual experiences dealing with showmen? SB: With open arms - It's been great. I had the privilege to meet Bobby Reynolds and James Taylor in person through the sideshow gatherings and have met numerous other showmen via the Internet. The gatherings are a great place to network. I've met a lot of great people working in the business, performers and artists alike. Always great stories! Definitely, not a profession full of dull people. SSW: Do you feel a connection to traditional sideshows and the dime museums? SB: Yes, very much so. Many of my pieces are in actual sideshow exhibits. I like to think that I'm helping to preserve the sideshow tradition and even becoming a very small part of sideshow history by creating my pieces. Unlike gallery shows, the sideshow is the perfect venue for my work because the ultimate compliment is when someone walks away thinking they just saw the Real McCoy. I show in galleries as well, but I can only get that sort of reaction from viewers within the context of the sideshow. A good customer of mine that owns one of my Chupacabra mummies had been displaying it as the real deal in his curiosity shop. It recently got some local press coverage as a potential real Chupacabra. It was subsequently "out-ed" as a fake, but it sure was fun while it lasted. I have other showmen with my Feejee mermaids that check-in periodically relaying conversations they have with the awe struck visitors as they walk out of the tent. I love every minute of it. SSW: How much of your work is commissioned? SB: At this point in time all of my work is commissions. I started out selling on ebay before I had my first website. After I set up the second website the commissions were keeping me too busy to create anything in my spare time for ebay. This is my only job and only source of income. It's a 24/7 one-woman operation and keeps me very busy. SSW: Where do you see the gaff business headed? Do you see the demand for your products increasing? SB: It's hard to say, but it seems the often oppressive "politically correct" climate is lightening up a bit. Freak shows, to some extent, seem like they're getting un-demonized. So, more sideshows means more demand for exhibits. So I'm hoping it will be awhile before this wave I'm riding hits the proverbial shore. SSW: I know different types of work take various periods of time to complete but could you give us a general idea of how long it takes to complete a project? SB: Small things like a 2-headed chick may take as little as 3-4 hours. But a taxidermy mount isn't something that you can sit down and do from start to finish all at one time. There are a lot of steps that require hours and/or days in-between each step. Skinning the animal is the first step, then the tanning of the skin which takes several days. In the interest of time management I will usually build the mannequin while the hide is in the tanning baths. Complicated mannequins may take several days to build, then another day to mount the skin over the mannequin. Then more waiting; detailing (finishing touches like painting exposed skin areas) cant' be done until the mount is totally dry, which is generally around a week. But you can’t just mount a skin and walk away from it for the week until it's dry. The skin needs to be adjusted daily, sometimes twice a day; pins moved around, adjusting fur or feathers repeatedly to "train" them into the position they will finally dry in. it's a long drawn out process so it's hard to say exactly how long the more complex mounts take – I guess around a week of 8-12 hour days not including the time it's drying in-between steps. SSW: I’m sure a few of our readers may wonder where you acquire your animals and parts. What different sources have you used? SB: I use exclusively recycled animal components in my work. That has been my primary mandate since the very beginning. I'm a strong proponent of wildlife conservation who also participates in wildlife rescue and rehabilitation in my spare time. None of the animals used in my work were killed for the purpose of using them in my art. I utilize salvaged road-kill and discarded livestock, as well as the many animals that are donated to me. Donated animals are casualties of the pet trade, destroyed nuisance animals and pests, or animals that died of natural causes. Friends, family, and complete strangers give things to me. I also make use of any specimens from the Science Museum that we can't use for research purposes. I adhere to a very strict "waste not, want not" policy in my studio - I recycle virtually every part of the animal in some manner. SSW: I notice that you sell a number of animal parts. How do you categorize this part of your work? Would this fall into your “waste not, want not” policy? SB: Exactly - I recycle every part I can. I don't waste any of the animal. Wasting any part of them makes them seem like a disposable commodity – to me, that would be disrespectful. I think each of their elements are special and I treat them as such. I have a deep respect and appreciation for animals and the natural world. I'm fascinated with the circle of life and intrigued with how different cultures honor their dead and deal with death. Immortalizing loved ones (be they animals or humans) by preserving their remains or creating sentimental remembrances out of their body parts does not sit well with the majority of western society and is unfathomable to the average thinker. Yet such practices have been the norm in many cultures throughout history and still are. Undoubtedly, the average American thinks such ghastly practices are only carried out by "savages" in primitive cultures. Yet these practices exist in this day and age in the "civilized" world – a well known example being the mummified body parts of saints on display in Catholic Churches around the world. My point being, reverence is relative. SSW:Some people find the concept of taxidermy and gaffs to be offensive, disgusting and maybe even immoral. How do you respond to these people? SB: This question of "respectfulness" is one that comes up often. I understand if people find taxidermy in general offensive, but if they're going to preach the evils of taxidermy they better be living a vegan lifestyle and not have any leather shoes in their closet. In regards to my work specifically, I'm totally fine if some people think my work lacks artistic merit. I welcome everyone's opinion and respect his or her feelings. But again, unless their vegan, any argument from them is hypocritical...what is more disrespectful towards an animal: (A) making art out of an animal that is already dead (B) killing a cow and shitting out a hamburger. People hate to think about animals dying. I think that taxidermy is often lumped together with hunting in people's heads - and for good reason, that's why most taxidermy is done. The majority of animals mounted by taxidermists are hunting trophies. I don't like to be lumped into the same category with taxidermists who do sportsmen's mounts. Traditional sportsmen's taxidermy is about preserving a moment, commemorating a human achievement - the killing of the animal. Hence the term "trophy" mounts. Conversely, my work is about commemorating the animal itself, not how it died. Dead animals in art and taxidermy evoke strong reactions and opinions, yet hardly an eyebrow is raised over the slaughter of cattle to make belts and steaks. I think it's odd that one use of an animal is so offensive and disrespectful, while the other barely evokes any thought at all. I believe it's because a steak has been depersonalized in the butchering process, no fur, no feet, and most importantly - no face. Just another example of the "out of sight, out of mind" mentality in our culture. SSW: Could you explain the resurrection concept in your work? SB: I think on some levels my work can be interpreted as creating "life" where there was death. But my work is not about trying to bring back the dead (as resurrection implies) my work is about paying homage to the animal – celebrating the animal. I deal with death, in what is considered by most, an unconventional manner. I don't view a dead animal as disgusting or offensive. I think that all creatures are beautiful in death as well as in life. I want to capture and remember their beauty. My early works in college were shrines to the animals they incorporated, creating final resting places for them. This somewhat ritualistic honoring of the dead (animals) can be traced back to my early childhood in the form of the elaborate funerals that were lavished upon dead sparrows and pet goldfish alike. We had lots of pets when I was growing up. I developed a close bond with these animals and was completely heart-broken when one of them would die. We always had a little graveyard for our pets in our backyard. When the family moved, dad moved the pet cemetery with us (Because my brother and I would have a fit if "mittens", or whoever, got left behind) Inevitably we were just digging up their bones. On several occasions rather than re-burying the remains I absconded with the bones and built little shrines hidden in my bedroom. I have the same respect for the remains of the animals I use in my work now as I did for the remains of the family pets. I feel that what I do in my work now isn't much different than what I've done in the past. My attitude about them is the same, but the "shrine" has just taken a different shape over the years. SSW: What does your family think of your occupation? SB: My parents may have told me not to play with dead animals when I was a kid, but they did encourage my interest in the natural world and nurture my artistic abilities. I suspect they may still secretly wish I’d taken my anatomical interests to a more lucrative level - such as a veterinary surgeon, but instead I graduated from the art school with their blessing. If it wasn't for their support I wouldn't be doing what I'm doing today. They're both artists and attended the Minneapolis College of Art and Design just as I did. I come from a long line of artists. My great grandfather Nicholas Richard Brewer was a prominent 19th century portrait and landscape painter whose work is now highly collectable, my great-great uncle Edward Vincent Brewer was a commercial artist and portrait painter who created the famous Chef Rastus character for Cream of Wheat as well as painting many of the taxidermy diorama backdrops in the Bell Museum of Natural History, my Grandfather N.R. Brewer II did medical illustrations as well as animation for Disney before he became a dentist, My father Richard Thomas Brewer is an internationally known fine artist who has had exhibitions all over the globe and whose work resides in major art museums, corporate collections and prominent private collections. My mother Sally King Brewer Lawrence is a well know children's book illustrator creating books such as "Silver Spurs", my Aunt Judy King Rieniets is a prominent fantasy art book illustrator who produced many collectable J.R.R. Tolkien calendars and posters. The list goes on and on and on. I'm merely carrying on the family tradition. SSW: Would you tell our readers a little about the Minnesota Association of Rogue Taxidermists? SB: The Minnesota Association of Rogue Taxidermists (M.A.R.T) is a collective of artists who share a common philosophy and passion. 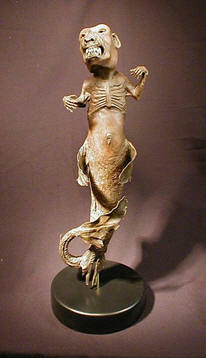 The group was created as a resource for meeting other artists working in taxidermy related mediums. We are here to network and exchange ideas with others interested in this art form. All members of M.A.R.T adhere to a strict ethics charter, using only animals procured in ethical and environmentally responsible manners. The group was created in 2004 with fellow co-founders and friends Robert Marbury and Scott Bibus. The creation of the group spearheaded a Rogue Taxidermy movement of sorts as the term "Rogue taxidermy" was introduced for the first time. Our mission is to bring like-minded artists together from here and abroad to unite under the genre "Rogue Taxidermy", and in doing so, gain recognition for this genre in the mainstream art world. But most importantly M.A.R.T. is in existence to create dialogue, evoke thought, educate, and expand people's horizons. I encourage your readers to visit our website. SSW: Many of us have had a helping hand along the way. Is there anyone you would like to thank? I would like to thank Sarina for taking time out of her busy schedule to do this interview for SIDESHOW WORLD. I’m certain our readers will find her interview entertaining as well as educational. Each month we will try and interview a new performer for the site. Because of the logistics of it face to face interviews are tough to come by. A good percentage of the interviews we will be doing will be via e-mail or telephone. If you are interested in being interviewed for the site drop us a line. is the sole property of John Robinson © ll rights reserved.